The detectives were responding to a call about a robbery at a cellphone store.The deceased was the first New York police officer to die in the line of duty since July 2017. 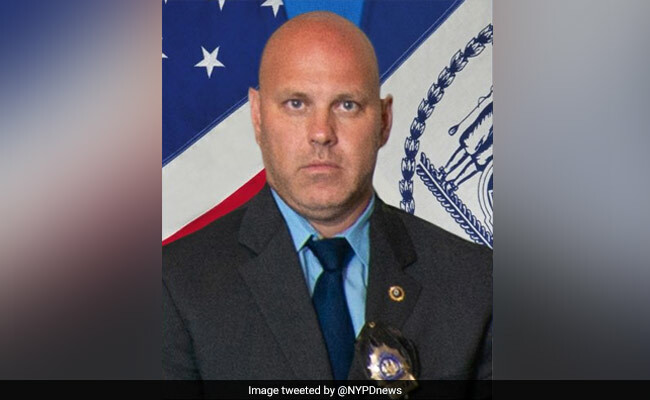 Brian Simonsen is the first New York police officer to die in the line of duty since July 2017. A New York City police detective was shot and killed by "friendly fire" while another officer was shot on Tuesday as they responded to an armed robbery, the city's police chief said. The detective was identified as Brian Simonsen, 42, a 19-year veteran of the force. Simonsen was shot in the chest and declared dead at Jamaica Hospital, Police Commissioner James O'Neill informed reporters. He was the first New York police officer to die in the line of duty since July 2017. The second detective was shot in one leg and listed as stable, police said. The suspect, described as a 27-year-old "career criminal," was not identified by police. He was shot multiple times and taken to hospital. An "imitation firearm" was found at the scene, the police commissioner said. "This is an absolute tragedy, the worst outcome any police officer or family of a police officer could ever imagine," police commissioner O'Neill added. "Friendly fire aside, it is because of the actions of the suspect that Detective Simonsen is dead." The detectives were responding to a call about a robbery at a cellphone store in Queens, the police said. Officers responded and fired multiple rounds, during which Simonsen was hit, the commissioner informed.